Become a member and save up to 50%! We want to give you a 15% discount. 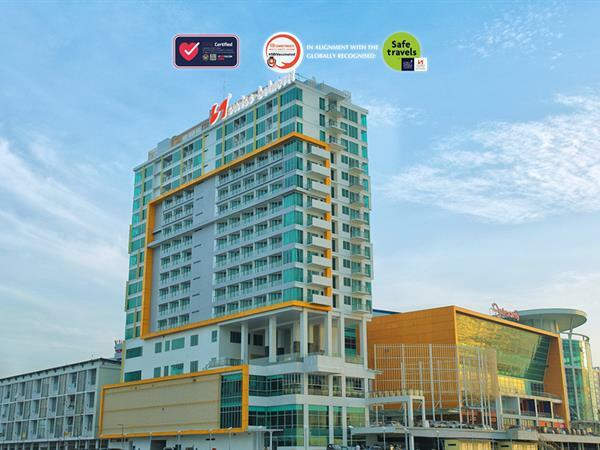 Swiss-Belhotel Balikpapan is a 4-star international hotel that provides a high quality standard of services and facilities. The hotel is ideally located in the central business and government district, only 15 minutes from Sepinggan International Airport. Swiss-Belhotel Balikpapan is located near to the sea and offers a variety of entertainment and leisure activities. The hotel features 200 guestrooms including Presidential Suite, Business Suites, Executive Suites, Superior Deluxe and Deluxe Rooms. Each room is facilitated with LCD cable television and satellite international channels, IDD/NDD telephone line, in-room safety deposit box, individually controlled air-conditioning, mini-bar, coffee and tea-making facilities, shower in all rooms and bathtub in Executive Club rooms. Wifi high speed internet access is available in guest rooms and in public areas. For a delightful culinary experience, the hotel offers superb international and local dishes. Buffet and à la carte menu are available for breakfast, lunch and dinner at Swiss Cafe Restaurant. Selections of snacks, cocktails and fresh juices are available throughout the day at Barito Lobby Lounge and Bar and at our Pool Bar. For meetings in Balikpapan, Swiss-Belhotel Balikpapan offers the biggest Ballroom in East Kalimantan. It can accommodate up to 2,000 persons for standing buffet or 1,500 in theatre style, while our breakout rooms provide additional support for guests to organise their business meetings or other events. Take advantage of our large variety of packages and special offers created by us and designed with your needs in mind. Stay in touch with all the latest news in Balikpapan. The hotel features 200 guestrooms including Presidential Suite, Business Suites, Executive Club Suite, Superior Deluxe and Deluxe Rooms. For a delightful culinary experience in Balikpapan, the hotel offers a variety of delicious international and local dishes in Swiss-Café Restaurant and a wide range of beverage selections in Barito Lobby Lounge and Bar. Swiss-Belhotel Balikpapan has an array of amenities and hotel facilities in Balikpapan that available for your personal well-being. Why not work out in our well-equipped fitness centre, or relax at the swimming pool facing the sea. Growing in popularity as an international tourist destination, the seaport city of Balikpapan is located on the eastern coast of Borneo Island beside an inlet of the Makassar Strait. .